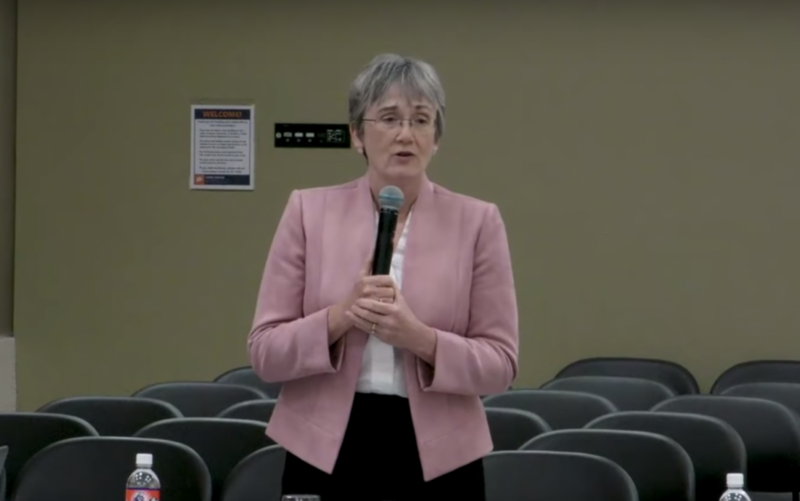 Dr. Heather Wilson addresses member of the Student Government Association Thursday, March 28. Photo Courtesy of UTEP YouTube page. Heather Wilson, the sole finalist for UTEP president, is expected to be appointed to succeed current UTEP President Dr. Diana Natalicio by the University of Texas Board of Regents April 2. The regents will be holding a special meeting via telephone conference call at 7 a.m. local time Tuesday. An appointment is expected to be made during executive session. Wilson was in El Paso Thursday, March 28 for the second time since being named the sole finalist for the position March 8. The U.S. Secretary of the Air Force spent the day speaking with selected students, faculty, and staff. She also spent her evening speaking to several news organizations including the El Paso Times and KVIA ABC-7. Wilson spent time addressing the selected few’s concerns including her voting record against LGBTQ rights and funding for black and Hispanic serving institutions as a former New Mexico congresswoman. Throughout the week, We the Coalition, a student-based group, has been protesting against Wilson’s appointment. The group also submitted a Change.org petition with more than 9,000 signatures to the office of UT Board of Regent Paul Foster in El Paso in hopes of influencing the Board of Regents to reconsider Wilson as the sole finalist. UTEP officials posted two of Wilson’s meetings on YouTube in its entirety. Click here to watch the Faculty meeting. Click here to watch the Student Government Association meeting.